... 1890, Lydia Becker (left) died in Aix-les-Bains, France, 63 years after her birth in Chadderton, Lancashire, England. (image credit) Educated at home, Becker eventually became active in learned societies, and at the 1886 meeting of the National Association for the Advancement of Social Science, the delivery by Barbara Bodichon entitled "Reasons for the Enfranchisement of Women" spurred Becker to career of activism on behalf of suffrage and other women's rights. For 20 years, Becker served as founding publisher of the Women's Suffrage Journal; her colleagues ceased the publication when she died. 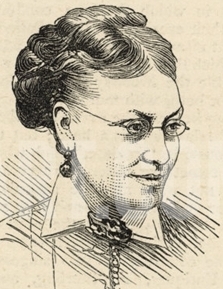 Becker also organized speaking tours for women, at one of which "fifteen-year-old Emmeline Pankhurst experienced her first public gathering in the name of women's suffrage."